The warm, distinctive flavor that cinnamon adds to dishes has been celebrated for long. 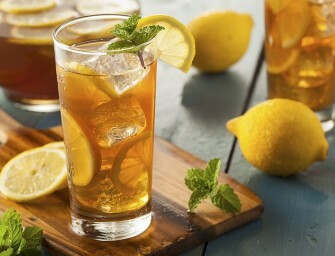 The sweet and delightful aroma it exudes infuses a soothing and relaxing feeling. But did you know that this ancient spice has one of the highest antioxidant levels amongst all spices? Extracted from the brown bark of the tropical cinnamon tree, this sweet yet pungent spice is botanically known as Cinnamonum verum and has over one hundred varieties, with the Ceylon cinnamon (true cinnamon) and Chinese cinnamon (cassia) being the two most popular varieties consumed. The bark of the trees are dried and rolled into cinnamon sticks, also called quills. With unique anti-clotting, anti-microbial and healing abilities, cinnamon offers a wide range of healthful benefits for a long and healthy life. Plus, the bountiful of antioxidants offered in cinnamon gives you a good reason to include it in your daily cooking. Check out the different nutritious benefits that cinnamon provides for treating various diseases and ailments. Cinnamon is native to Ceylon, now Sri Lanka, though its history dates back to Chinese writings to 2800 BC. Being one of the oldest spices known, cinnamon was a powerful spice used in Egypt, Rome and China on an extensive level. While the Egyptians used cinnamon as a beverage flavoring, medicinal, and embalming agent; the Chinese treasured it for its varied medicinal benefits. Cinnamon was also mentioned by Pliny the Elder, Dioscorides, Theophrastus and in the Bible as well. The Portuguese arrived in Ceylon in early 16th century and re-established the traditional production and management of cinnamon by the Sinhalese. They enjoyed monopoly for over hundred years until the Dutch seized the Portuguese in the 17th century and captured the world’s largest cinnamon supplier, the island of Ceylon. Later towards the end of the 18th century, the British dislodged the Dutch from Ceylon and took control of the island and cinnamon trading, in turn. However in the 19th century, the cinnamon monopoly saw its downfall as cinnamon could be grown in other countries, like Java, Sumatra, Borneo, Mauritius, Guyana and Réunion as well. Today, Sri Lanka, India, Madagascar, Brazil and the Caribbean are the leading producers of Ceylon cinnamon, while cassia cinnamon is cultivated by China, Vietnam and Indonesia. Cinnamon extracts are anti-microbial which means they are essential for combating the growth of harmful bacteria or fungi, particularly those responsible for Candida, or yeast infections. Studies reveal that cinnamon has been beneficial on blood-sugar control as well. High-carbohydrate meals tend to increase blood sugar quickly since they are flushed out by the stomach rapidly. Cinnamon, when added as a seasoning on high-carbohydrate foods, slows down the rate at which food is emptied from the stomach, thereby reducing the rise in blood sugar. By improving the ability of the cells to respond to insulin, cinnamon normalizes the blood sugar levels in people suffering from diabetes. Cinnamon contains compounds that stimulate insulin receptors and inhibits an enzyme which inactivates these insulin receptors, allowing the cells to utilize glucose more effectively. Being a cognitive stimulant, the aroma and flavor of cinnamon helps in enhancing and improving working memory, visual-motor speed and virtual recognition memory. Chewing cinnamon-flavored gum or just smelling cinnamon boosts the activity of the brain. 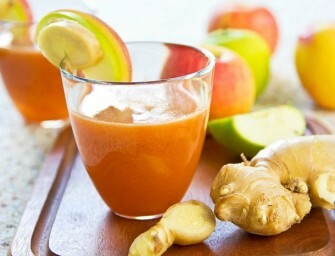 Inflammation has been identified as the major cause of heart disease, especially of the internal tissues and organs. Following an anti-inflammatory diet helps in reducing the risk of heart diseases and strokes. Cinnamon is an excellent anti-inflammatory agent that improves circulation and enhances oxygen supply to the cells, thereby providing protection against heart disease. Cinnamon is very effective on both external and internal infections due to its antifungal, antibacterial, antiviral and antiseptic properties. As such, it is useful in destroying germs in the gall bladder and bacteria in staph infections, and fighting vaginal yeast infections, oral yeast infections, stomach ulcers and head lice. Since cinnamon aids in removing blood impurities, it is highly recommended for treating pimples and acne. 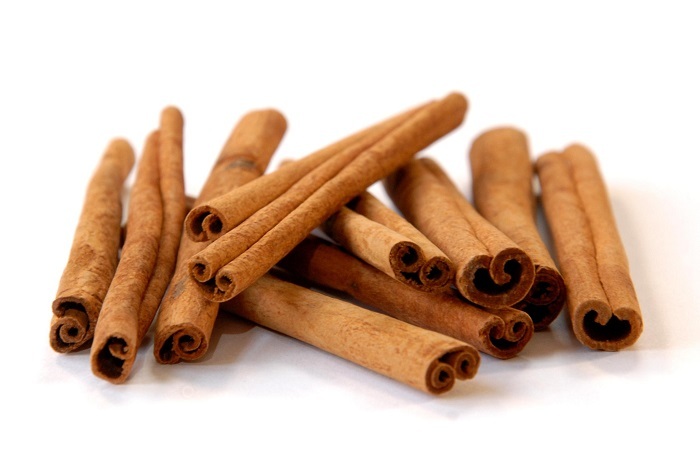 Being diuretic in nature, cinnamon assists in secretion and discharge of urine. It is also believed to arouse sexual desire since it is aphrodisiac and helps in the secretion of breast milk. Cinnamon has about 247 calories per 100 gm of weight. Cinnamon can be found in both stick and powdered form. Cinnamon powder tends to have a stronger flavor compared to the sticks. To check the freshness of cinnamon, pick up a stick and smell it. In case it gives off a sweet aroma, you know that you have selected a fresh quill. To differentiate between true and cassia cinnamon forms, check out their appearance. While true cinnamon sticks are curled in a telescopic form, cassia quills curl inward from both sides, like a scroll. What comes as a challenge is distinguishing ground cinnamon from ground cassia. 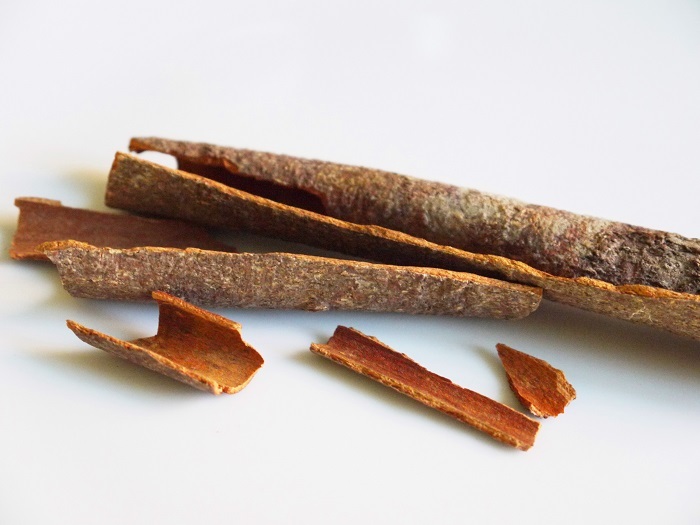 While true cinnamon is tan in color with a warm, sweet flavor, ground cassia has a reddish brown color and is coarse in texture, with a bitter, stronger and more aromatic flavor. Cinnamon sticks can be stored for longer durations compared to powdered cinnamon. Keep the sticks in a glass container and seal it tightly. Store in a cool, dry, dark place. This way, the sticks will last for up to one year. Ground cinnamon keeps well for six months when stored in an air-tight container. To extend its shelf life, store powdered cinnamon in the refrigerator. It is best to buy small quantities of ground cinnamon since it tends to lose its flavor and aroma soon. Besides, keep smelling the ground cinnamon to check if it’s still fresh; discard if it does not smell sweet. For best flavor and taste, grind some cinnamon quills at home using a spice or coffee grinder. Else, you can even use whole cinnamon quills.